In my last post, I wrote about how I came to the Burke Library. 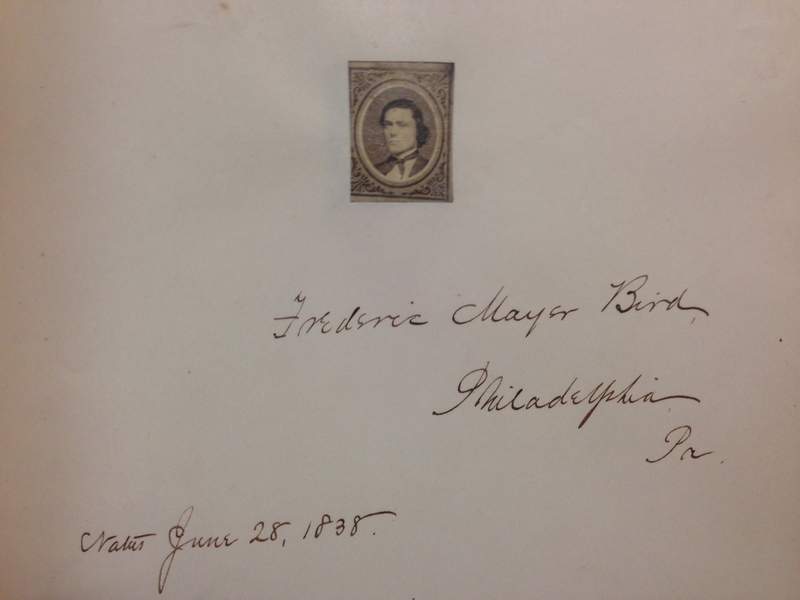 For this post, I’d like to talk about how one of the collections I processed came here–and how coincidental it was that it was assigned to me. 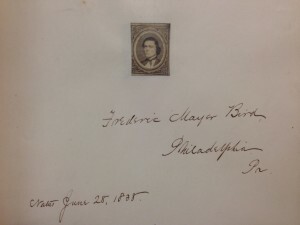 My first task on being given the Frederic Mayer Bird papers was to research their creator. I soon discovered that Bird, a nineteenth-century expert in hymnology and hymnody, in other words, the study and performance of hymns, was a productive writer. In addition to editing and publishing books and articles on his own area of research, he wrote fiction. Both the amount and the kind of writing were in the family line: Bird’s father, Robert Montgomery Bird, was one of the most successful dramatists and novelists of the antebellum period. I knew the father’s work before I encountered the son’s: I had previously read The Gladiator (1831), a historical drama about Spartacus’s slave uprising in ancient Rome and Sheppard Lee (1836), a fantastical novel about a man who dies only to have his soul cycle through other people’s bodies until they/he die. There was nothing quite so fantastic in Bird’s papers, though hymns, of course, do relate to the soul. A small photograph of Bird, UTS class of 1860. The Burke Library Archives, Union Theological Seminary Records, Series 18, Class Photographs. It was noted at the time that many of the volumes had “many manuscript annotations.” In fact, 338 records in Clio carry a note that reads: “Ms. annotations by Prof. Bird.” Doubtless there are more. Some of those books were even found to have clippings, notes, and letters in them. Two letters from Henry S. Burrage, longtime editor of a Baptist newspaper, are an example. On November 2, 1886, Burrage wrote Bird about a new book project: “I am preparing for publication a work on ‘Baptist Hymn Writers and Their Hymns.’” Burrage was hoping that Bird would be able to answer a question about a particular hymn Burrage was planning to include. Two years later, November 12, 1888, Burrage wrote again to offer thanks: “I send you a copy of my ‘Baptist Hymn Writers,’ as a small token of your kindness to me during its preparation.” Both letters, a librarian’s note accompanying them in the Bird papers remark, were within Bird’s copy of that book when they came to Union. On the contrary, the letters are valuable for the way they document Bird’s consultations with a network of pastors, scholars, and collectors that traded the texts and histories of hymns. Bird was uncertain of the value of other parts of his papers, as well: “The hymn-cuttings are of no account,” he wrote, and “my clips from newspapers … may be little better. I by no means require the Library to preserve or even examine all in the parcel.” The library has preserved his papers–letters, hymn-cuttings, newspaper clips and all. A finding aid for the collection, including an index of correspondents, is available on our website. George Lewis Prentiss, The Union Theological Seminary in the City of New York, (New York: M., W., & C. Pennypacker, 1899), 358. This entry was posted in Archives, Student Entry on July 24, 2015 by Alex Black. I come to Columbia University Libraries this summer as a Career Enhancement Program Fellow. The program, administered by the Association of Research Libraries, offers library students from backgrounds underrepresented in the profession the opportunity to work and be mentored in a member library. This internship, coming as it does toward the end of my graduate studies at Simmons College, has already proved to be an invaluable experience. My internship began three and a half weeks ago in the Rare Book and Manuscript Library (RBML). While I was there, I worked with curators Karla Nielsen and Thai Jones on an analysis of the RBML’s collecting practices over the past five years. Gathering information from the RBML’s acquisitions and accessions databases, as well as its staff, I reported on any number of aspects of collections development at RBML, including the number of collections that were gifts or purchases, the formats present within those collections, and the collecting areas to which they contribute. The project gave me the chance to explore many of the RBML’s functions, as well as the digital and analog resources that document them. Now I begin at the Burke Library, where for the next three and a half weeks I will assist Brigette Kamsler in processing the archives of the Union Theological Seminary. This project combines my interests in the archives of institutions of higher learning and in historical religious culture. The latter subject preoccupied me in my former career as a scholar of the nineteenth-century antislavery movement, which drew on evangelical organizations for support–financial, strategic, spiritual, or otherwise. I look forward to taking collections through the process of organization and description, and in such beautiful surroundings and with such agreeable colleagues! This entry was posted in Collections on June 26, 2015 by Alex Black.